Professional Putty - now in new, styrene-reduced quality. 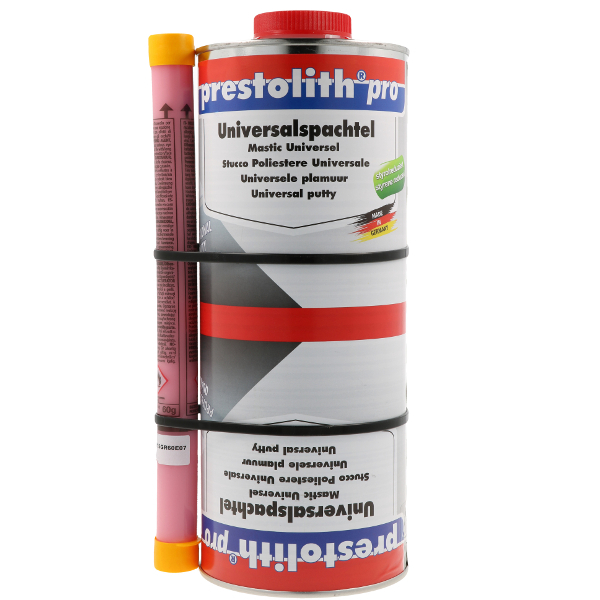 prestolith pro 2-K Universal Filler is a 2-component polyester putty. For universal use in garages, workshops, in machine-construction enterprises, metal-working, wood-processing and concrete-processing works, carpenter's shops. 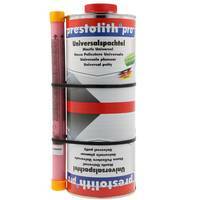 For use on many materials, such as metal, wood, concrete. Especially suitable for the ose in the presto proportioner art.no. 610015. 24 months if appropriate storage provided (=10°-25°C, relative air humidity of max. 60%) in the unopened original container. Protect from direct sunlight, frost and humidity. The surface should be de-rusted, clean, dry, free of grease and sanded. Apply the mixture in the desired thickness.